Click the button below to add the 2016 Zipp 404 Firecrest Carbon Clincher Disc-Brake Rear Wheel to your wish list. With the increasing popularity of disc-brake road bikes come the increasing offerings of disc brake wheels for those bikes. 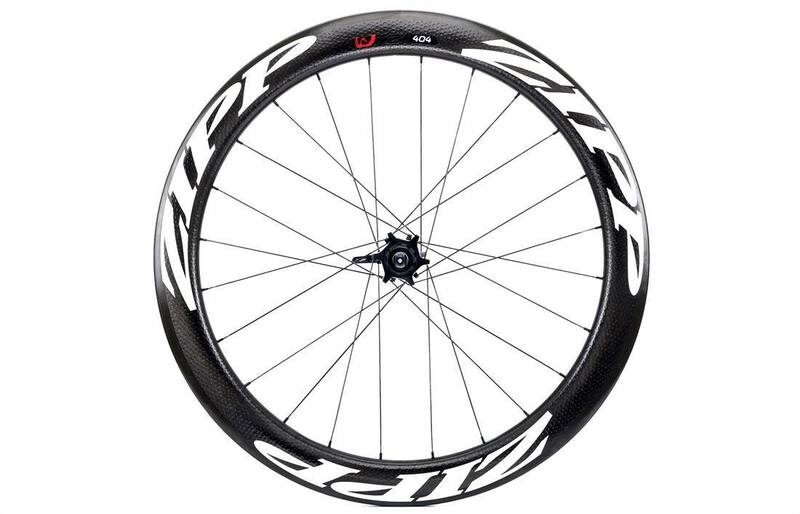 Here you’ll find the Zipp 404 Firecrest Carbon Clincher Disc-Brake Wheelset. It marries Zipp’s 58mm deep carbon clincher with their disc-brake hubset for a fast set of hoops that can take on most terrain. You’ll notice that the Zipp logo covers the depth of the rim. This is one of the few differences from the standard rim-brake 404. It is actually the same rim in both applications as the outward force that an inflated tire puts on the rim still needs to be counteracted. The second big difference is the spoke count. Here, you’ll find 24 spokes front and rear, with a two-cross pattern both front and rear. In both cases, the change is as a result of needing to counteract the forces that stopping a rotor by the hub create. The spokes are the excellent Sapim CX-Ray’s. The rim is a killer. It’s the Firecrest shape: 58mm deep, getting as wide as 26.53mm, it moves through the wind but is still light enough for climbing. The oval shape that is blunt on both the leading and trailing edges is not only good in a headwind, but very stable in crosswinds. The width means a better tire shape, even with narrow 23mm tires, providing more air cushion and a better contact patch. Greater comfort and lower rolling resistance result. Weight for the front wheel is 800g, the rear 915g. The hubs are a good bit different than what you’ll find on rim-brake wheels. Zipp employs their 77/177D hub set, which was purpose-built for disc braking. The flanges are slightly taller to work around the six-hole rotor mounts and the 17mm axle. While you can see that the spokes have a two-cross pattern, it actually possesses the lateral stiffness of a three-cross thanks to the size of the flanges and the orientation of the spokes. The benefits of the design are better aerodynamics and greater lateral stiffness. For rear wheels, Zipp offers both a Campagnolo-compatible, and Shimano/SRAM-compatible cassette body. The latter comes with a spacer for 8/9/10-speed cassettes. In both cases, the 177D hub body allows you to install a SRAM XD-cassette body for super-wide range gearing. The wheel comes with quick release, end caps to convert the hub for thru-axle use (end caps are hand swappable), rim strip, valve extender, and Zipp Tangente tube. The end caps can turn the front wheel into 12x100mm and 15x100mm thru axles, and the rear wheel 12x135 and 12x142mm thru-axles. Zipp has taken innovation in their system to a new level with these tubes, which feature an aluminum, rather than brass, stem. Lighter, better machined, and possessing a removable valve core. It also improves the balance of the spinning wheel. The wheels are not designed for compatibility with tubeless systems. Tricking out your disc-brake road bike is easy with the Zipp 404 Firecrest Carbon Clincher Disc-Brake wheels.